Last August 11, two Los Angeles police officers were involved in the fatal shooting of an unarmed black man, Ezell Ford. The shooting happened two days after the killing in Ferguson, Missouri of a black teen by a white police officer. Similar cases around the country have made the issue of deadly force by police a hot-button topic widely covered by the media. 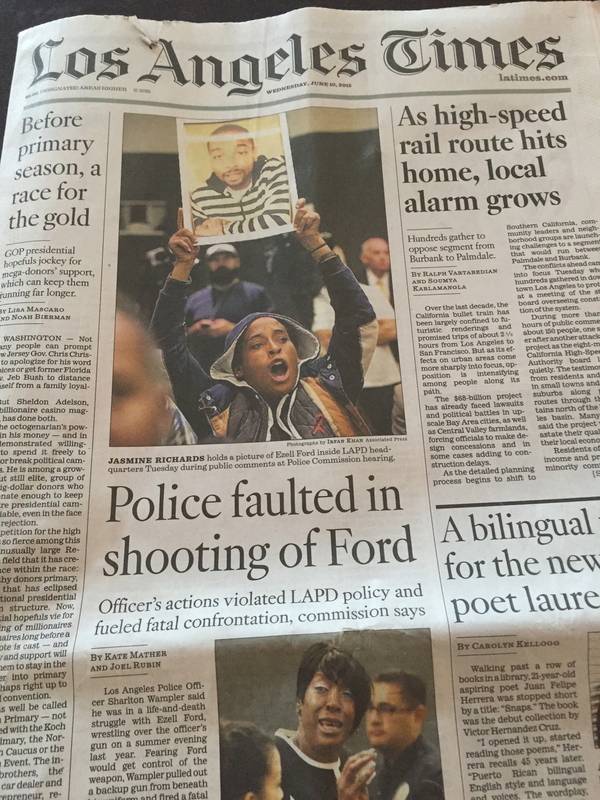 That’s why yesterday at the Times was an extraordinary day for my fellowship as I witnessed the “Digital First” mentality of the the news organization as it covered the Los Angeles Police Commission hearing into Ezell Ford’s killing by police. The hearing was held at police headquarters in downtown Los Angeles, one block from the Times office. There were several staff photographers and reporters on scene. Updates were sent to the L.A. Now blog, which included texts, photos and an impressive Twitter feed that reported up-to-the-minute news from the scene, including photos. I noticed Times reporter Marisa Gerber outside tweeting about protester interactions with police. Kate Mather was getting quotes and updates from inside the hearing room. There were important updates throughout the morning. At one point protesters inside the hearing began chanting loudly and became so disruptive that commissioners left the hearing room. One protester outside was also temporarily arrested. 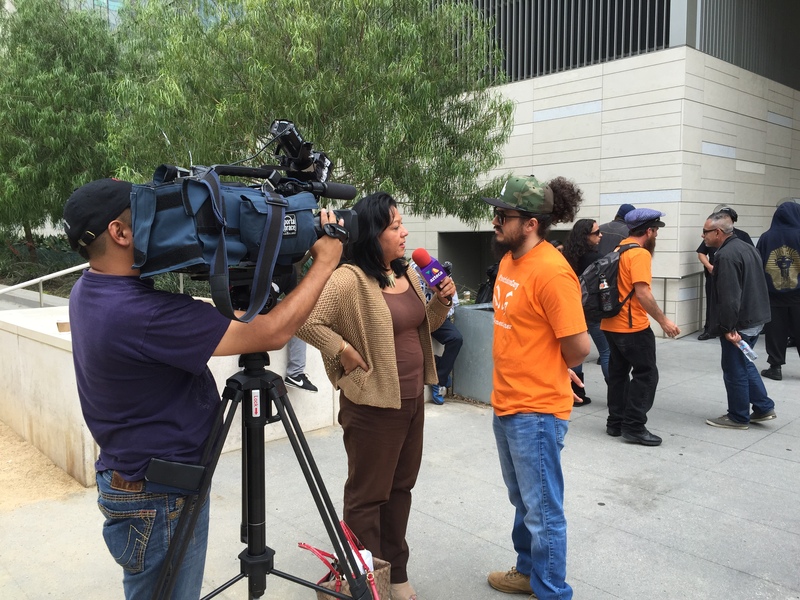 To the right you can see a reporter from Azteca America interviewing a protester outside police headquarters as the hearings were held. I jumped into the coverage and used my Times employee badge to gain access to the hearing room. 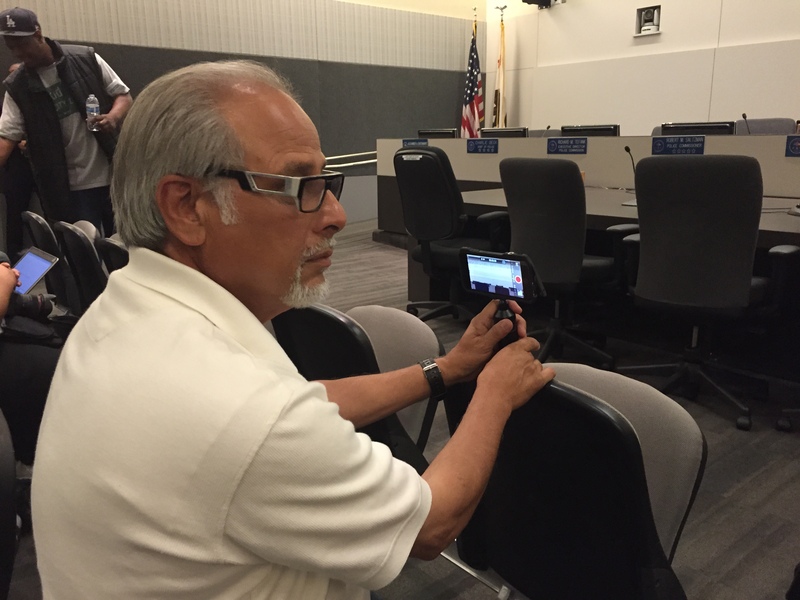 I shot video with my cell phone to experiment with using a mobile device to report a story. I returned to the newsroom and worked with the video editor to edit the footage using the app Videolicious. The Times prefers using this app for quick-hit videos from the field, and I’ve enjoying experimenting with it. Since I had several clips from scenes inside and outside of police headquarters, I found the app limiting to creating a more detailed video story. The editor suggested that I try the iMovie app on my phone. This was more successful and I produced a one-minute video of my clips that told a story of the morning. I learned a lot from doing this! I will definitely aim to have students use cell phone video apps in my multimedia and media production classes. 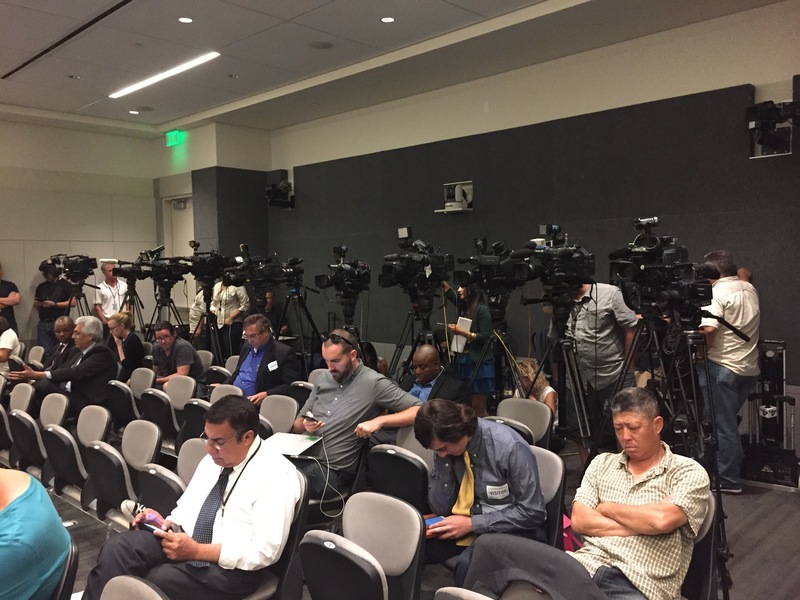 In the afternoon I returned to the hearing room as the assembled media awaited the decision by the police commission. It was interesting to note the large number of local broadcast crews who were present. I chatted for a bit with Times photographer Ifran Khan. He has a long background in still photography but has embraced video as well. When shooting stills he uses a professional camera, but when doing video he uses his iPhone. It can be daunting for a news photographer to decide when to shoot stills or video when covering a breaking story such as this one. Khan managed to successfully do both as his photos and video clips were published. Khan clearly enjoys making short videos using Videolicious. He explained that interview subjects often are more relaxed when he shoots video using his cell phone, so he can get them to be more natural on camera and get a better story. To the left you can see Khan with his iPhone prepared to shoot video when the commissioners returned to the hearing room to announce their decision. After the hearing ended I took all my footage from the day and used my laptop with Final Cut to edit a 90-second video story and sent it to the video editor around 8:30 p.m. Looking forward to hearing his comments today. Here is the Times’ cover print story with Khan’s photos.